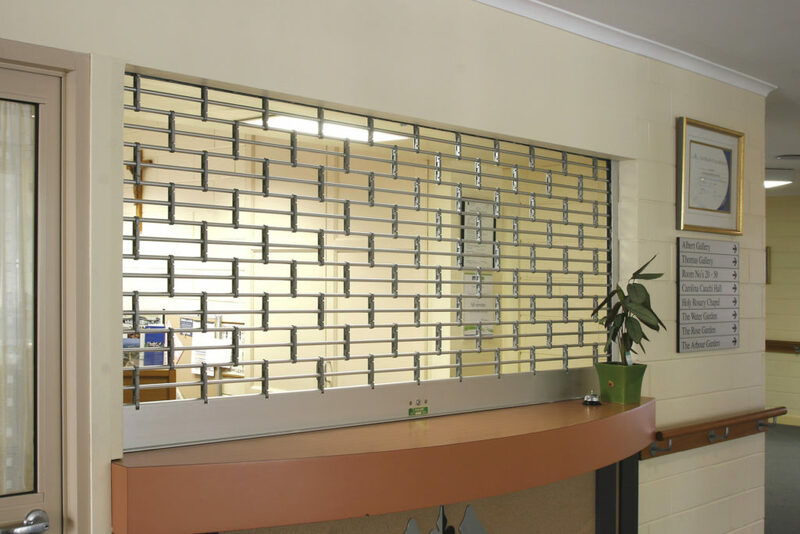 This is designed to suit security closures to entrances, passages, doorways, bars, cash and servery counters. The partitioning of large open areas such as clubs, hotels, shopping centres etc. is also recommended. The security roller grille will be as manufactured by 3rd Generation Doors. 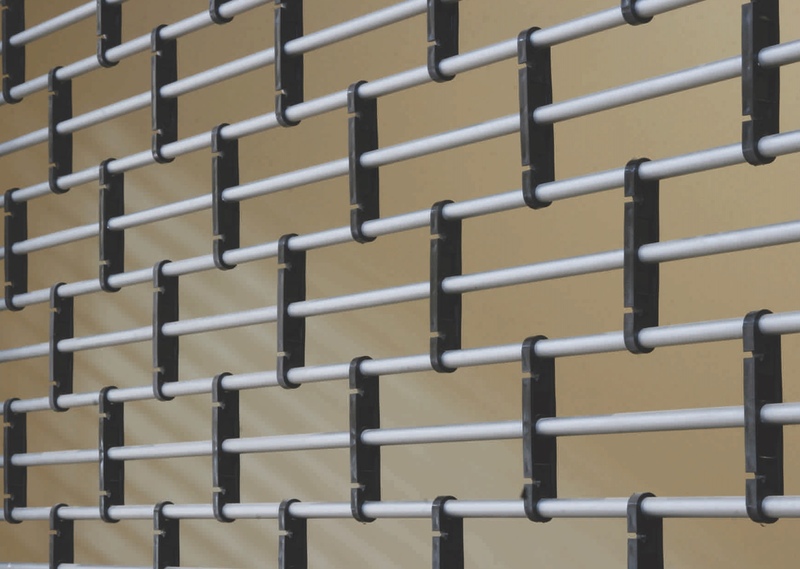 The curtain will be constructed using 12mm aluminium anodised tubes at 50mm centres and hinged by using moulded A.B.S. links to form a brick pattern and designed to roll up overhead, manually. The curtain will be constructed using 12mm diameter by 1.2mm thick anodised aluminium tube spaced at 50mm centres in height and fitted with moulded A.B.S. hinged links which are pinned to the tubes at 210mm centres to form a brick pattern design. The bottom rail will be a specially extrude aluminium section measuring 120mm in height by 2mm thick. It will have access incorporated into the body of the rail to house a "mortise"concealed locking system. The centre door mullions will be used for wide openings and multiple door installations. The centre door mullions will be manufactured from specially extruded anodised aluminium sections having a minimum width of 125mm by 30mm depth. The mullions will be a lift-out type fitted with shoot bolts locking at the bottom of the mullion. The corner and angle mullions will be used when two grilles meet at a corner. The mullion will be manufactured from aluminium sheet formed to suit the angle and size as required. Manufactured to suit any width of opening with the use of removable or fixed mullions. 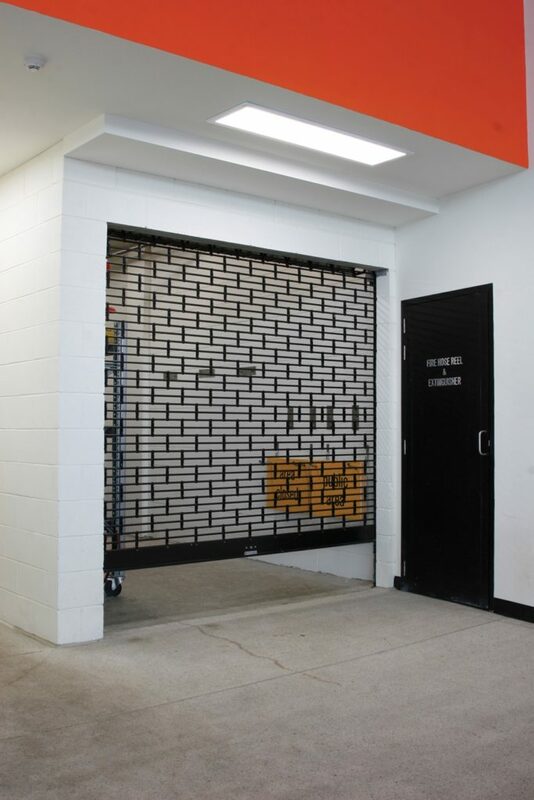 Individual shutters are manufactured up to 3 meters in height or 3 meters in width without exceeding 10 meters square. All aluminium sections are natural as standard. A wide range of colour anodising or polyester coated finishes are available when specified. The hinge links are aluminium Grey as standard. A wide range of colours are available, i.e. Aluminium Grey, bronze, black, gold, red, yellow, green, white and blue. Vermin proofing and added security. 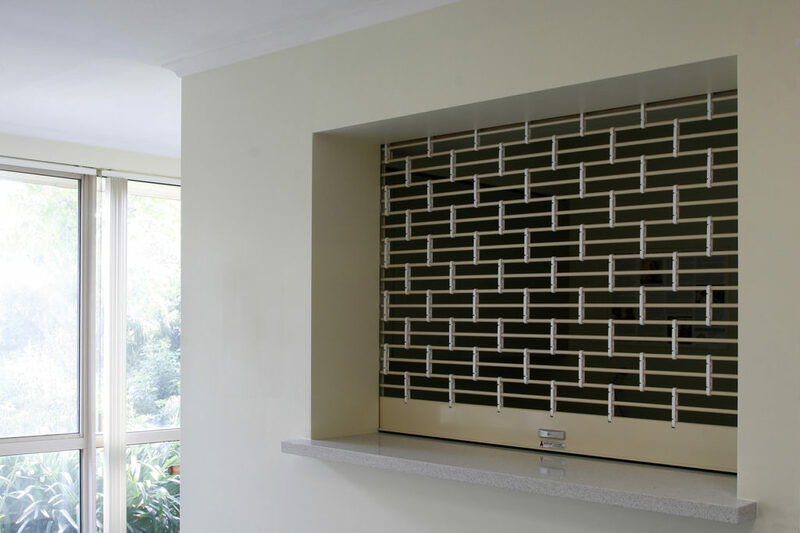 The grille curtain is fitted with specially extruded clear PVC. interlocking slats of continuous length. The slats are locked into the moulded recess provided on the hinge links. The roller drum will be manufactured from a 150mm or 200mm diameter spiral ducted tube and will be attached to nylon drum wheels. The roller drum will be fitted with helical torsion springs with a counter balanced mechanism matched to suit the grille size and weight. The drum shaft will rotate around a 40mm diameter shaft. The roller drum will be designed to give minimum deflection over the grille span. The grille drum support brackets will be manufactured from either mild steel plate having a minimum thickness of 3mm (between wall fixing) or mild steel angle type brackets (behind wall fixing) to be matched to suit grille size and weight. Fixing will be using masonry anchors and/or hex head bolts or as specified for steel work.